The main shop has an extensive collection of fine violins, violas, cellos and basses, plus an occasional mandolin, guitar or banjo. You'll also find a collection of bows in all price ranges. 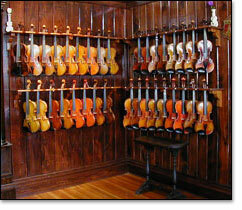 Our customers love to come in and try our instruments in our showroom. The room is live enough to reveal the richness of the instrument's tone yet large enough to test its carrying quality. 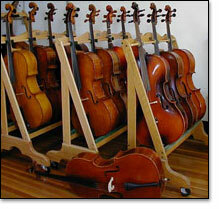 We carry a large selection of accessories as well: strings, rosin, shoulder pads - everything you need to be well-outfitted. The rich wood-paneled room with its antique instruments and oriental rugs is an ideal place to shop for your special instrument. The surroundings are relaxed and comfortable. We invite you to come see for yourself.